How would the YOU of 10 years ago respond to the YOU of today if you could have seen yourself via a time machine? The me of 10 years ago would honestly be totally blown away. I could run circles around the 23 year old Jessica. This thought motivates me on countless days. What do I want the 43 year old Jessica to look, sound, and feel like? Lack of personal devotion, prayer, exercise, healthy eating, and self-discipline will not get the 33 year old Jessica to where the 43 year old Jessica wants to be. 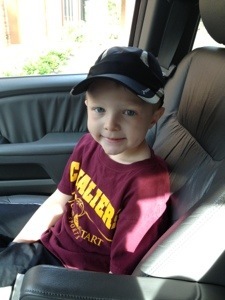 My little man sporting his Brooks running hat. 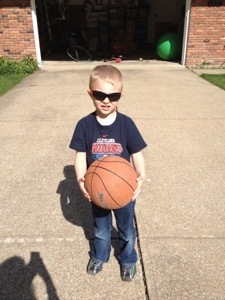 He is working towards being a marathoner one Kid’s Fun Run at a time. So, all the runners out there know what it is like to wake up the day after a race and ask yourself “What was I thinking?” This is the moment that your legs are tight, your hips are tense, your toes could be turning black and purple, and your body is retaining mega water thinking you are going to go do something crazy again, like run 13 or more miles. Surprisingly, I haven’t had any of these post race experiences since the Capital City Half. I trained up to 14 miles and truthfully had more hip pain during training, while running my long runs slow (30 sec/mile slower than race pace) than I had from pushing myself on Saturday. This begs the question, did I really race? I should have felt spent at the finish line and the day or two after. I still think that because I’m a novice of sorts and because I have dealt with a few nagging little injuries that I error further on the side of conservative, even in light of the PR, than I should. I think that with time and confidence I will grow in this area. I did feel at certain mile markers like I was giving it my all, but perhaps I still had more go in my system than I even realized. After the race, Jonathan and I walked around. We probably walked 1.5-2 miles to stretch out our legs and shake the race off. The following morning, I ran 2 miles before church at a conservative pace and felt surprisingly good after the first .5 mile. It’s hard to tell how things would’ve gone down because the run was so short, but the goal was rest while still maintaining the run streak. Monday, I ran my usual Monday 5K and was expecting another slow, shake out run, but surprised myself with a strong run. I followed this with weights. I took the week of the race off of my weight/strength training to give my muscles time to rest for the race, and it worked like a charm. I eased back in on Monday, but still felt the weight lifting aftermath in certain muscle areas. Tuesday, I did a 6 mile run/.5 mile walk and again felt amazing. This proves to me I was thinking too conservatively on Saturday. Oh well. Hindsight is 20/20 and since my goal is lifelong fitness and wellness and since I will never win one of these events anyway, I still celebrate my strong showing and I met all of my personal goals. Today I ran my usual Wednesday 5K at a respectable pace and followed up with my strength and weight training again. I was hitting the Kettle Bells pretty hard again, so tomorrow I’m going to either wake up as Wonder Woman or with a case of serious Delayed Onset Muscle Soreness (the dreaded DOMS). Day 541 of the Runstreak was celebrated today! Can you believe it? What was I thinking starting this streak? We kicked off Reese’s birthday week with a Cinco de Mayo celebration. I spent quite a bit of time in the bounce house with my boys. That my friends is a serious workout. I may be able to run a marathon, but I can only bounce intensely while maintaining my balance for about 52 seconds. More will be coming about Reese’s birthday on the blog. You should know how I LOVE birthdays and we celebrate them for days on end. Jonathan at the celebration. The truth is this picture isn’t really of Jonathan. 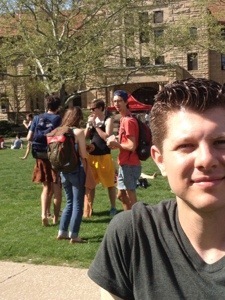 He was my decoy so I could take a picture of the guy wearing a skirt behind him. This was not a kilt or a gimmick. He was dressed in a full blown skirt that looked like it was purchased at Dress Barn. 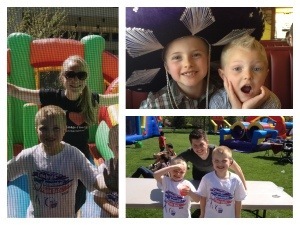 Representing the Bridge Church at the Cinco de Mayo Celebration. I’m always in Mission Mode! 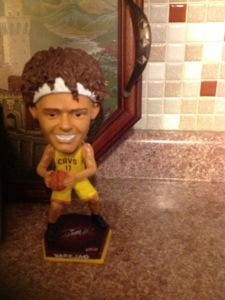 If you do not have one of these on display in your home, rush immediately to your nearest Cleveland Cavaliers memorabilia store and get one. There is nothing like having this stare at you throughout the day. Do not be jealous of me. In that same vein, do your children have any “Chuckie” esque (Reference to the movie “Child’s Play” for those born after the 80’s) type toys that taunt you lying around? This is the week that the tree pollen count is the highest? 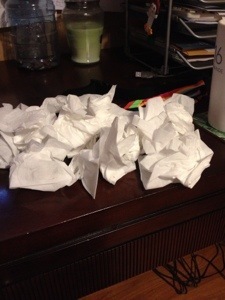 Who else is having fun and dealing with issues?……………..I mean tissues! I like Claritin. What gets you through these days? 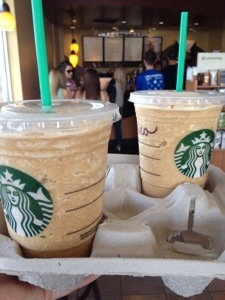 Did you know that Starbuck’s is having Happy Hour until May 12th on all of the Frappucino’s? 50% all Frappucino’s between 3 PM and 5 PM. I like the Coffee Light Frapp. What is your go to cold, frothy beverage at Starbuck’s?